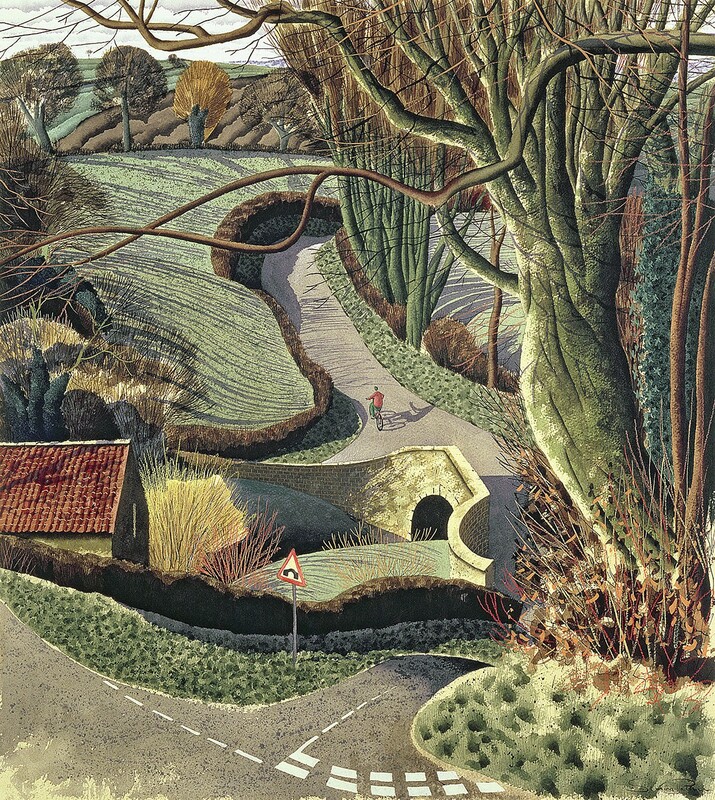 Simon Palmer works mainly in watercolour and is widely recognised as one of Britain's finest landscape artists. Simon was born in 1956 in South Yorkshire but it was in Reigate, Surrey where he studied at Reigate Art College focusing on illustration and graphic design where he was mentored by illustrator and watercolour artist Earnest Boye Uden. It was Uden who encouraged Palmer to use watercolour to depict his landscapes. Simon initially chose the nearby landscapes of Kent for his subjects but later returned to Yorkshire where he continues to live and work incorporating people and place in their surroundings for his subject matter. Simon has shown at the Royal Academy Summer Exhibition; the Crane Kalman Gallery, London; at Glyndbourne Festival Opera Exhibition, and the National Trust Centenary Exhibition, and a retrospective was held at the Mercer Art Gallery, Harrogate. In 2007 Palmer won the Winsor and Newton Prize for best watercolour at the Royal Academy Summer Exhibition. 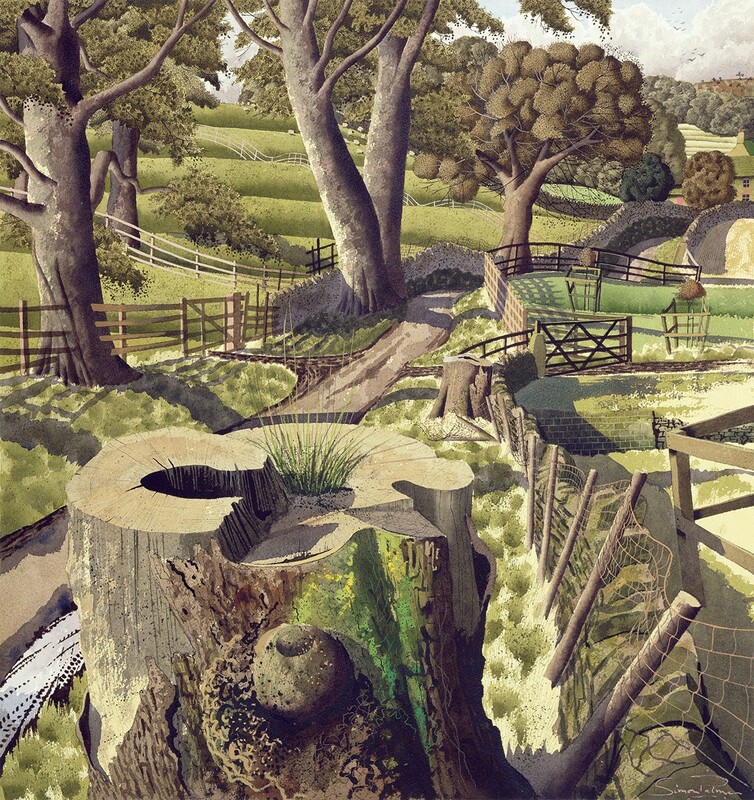 Simon's landscapes incorporate both narrative and detail in their representation. Pen and ink are used precisely to capture minute details such as a leaf or twig on an oak tree giving accurate composition; detail that is part of yet sits alongside an often purposeful, sometimes whimsical narrative that incorporates people going about their everyday movements; walking, cycling, working and so on taking place amongst the roads, lanes and hedgeroads of an archetypal portrayal of a certain type of England. The result is a landscape depicting a reality that somehow allows for a more fluid social construction of a rural idyllic Yorkshire. Limited edition highest quality Giclée Prints, hand-numbered and hand-embossed. These are modern Giclée reproduction editions of an original paintings. Images protected by Bookroom Art Press. Image Size: 515mm x 490mm (image size does not include paper border, mount and frame) Format: Giclée Print, [ed. size 850] on 310gsm thick 100% cotton rag. Hand-numbered and hand-embossed. Price: £225.00. Watercolour on paper, (1998). Original size: 63.5 x 60.0 cm. Image Size: 545mm x 485mm (image size does not include paper border, mount and frame) Format: Giclée Print, [ed. size 850] on 310gsm thick 100% cotton rag. Hand-numbered and hand-embossed. Price: £225.00. Watercolour, ink and gouache on paper, (1996). Original size: 66.0 x 59.5cm.